... and it's Pepsi Mont Blanc. Once upon a time I licked a brick. Don't ask me why. We do strange things when we're young. But if I'm not mistaken, I licked that brick quite voluntarily. And today quite voluntarily I bought a bottle of Pepsi Mont Blanc. For those who don't live in Japan - every so often Pepsi comes out with a new seasonal flavor here. There was Ice Cucumber Pepsi (quite OK), there was Baobab Pepsi (diluted bathroom cleaner with just a hint of a more potent chemical when the aftertaste kicked in). There was Shiso Pepsi, which I skipped, because I can't stand shiso (perilla). There was Blue Hawaiian Pepsi, which was actually quite fun. Mercifully, I've been spared Pepsi White (yogurt flavor). And there was Azuki Pepsi - red bean Pepsi - stuff so horrid I still get a gag reflex just thinking about it. I thought that Azuki Pepsi would be a tough act to follow. I was wrong. Mont Blanc Pepsi is a worthy successor in the long line of Pepsi's undrinkable novelty flavors. 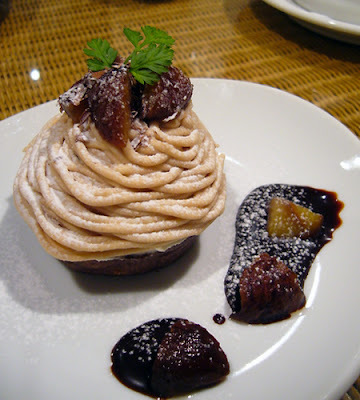 Mont Blanc is a chestnut cream cake, a very popular dessert in Japan, and presumably, in other parts of the world as well. I used to kind of like it. Until I tried a particularly awful one from Ginza Cozy Corner (at Apita in Utsunomiya). Now I'm permanently chestnut cream caked out. Image by Jasmine Yomei via Flickr CC. If you are intent on trying mont blanc, you can get it at just about any Japanese bakery or sweets shop, for example at Panya (8 Stuyvesant St) in New York City. And just to clarify my beverage preferences - I don't drink Pepsi. The stuff is horrid, even without any funky flavors. See? For me Ice Cucumber Pepsi was actually an improvement over the regular thing. OK, so I'm a glutton for punishment. 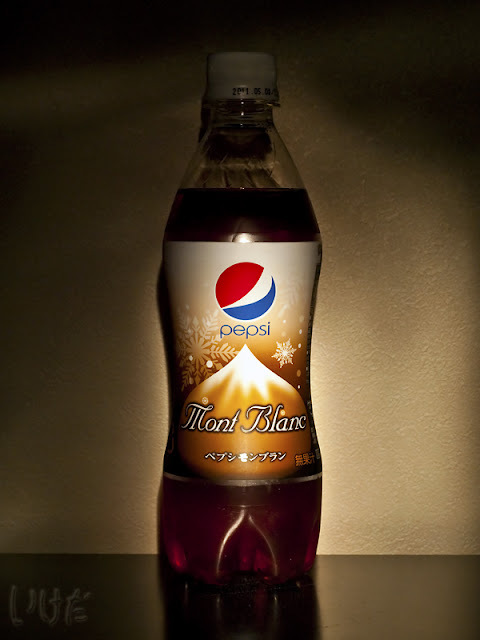 I bought a bottle of Pepsi Mont Blanc. And actually tried it. And that brick that I licked as a child was an instant flashback. The base flavor was about the same - raw brick. But with a just a hint of burnt cappuccino and bitter chocolate aftertaste. Or bitter cappuccino and burnt chocolate. As hard as I tried, I couldn't taste any chestnut. Not to mention cream or cake. Only brick and stale coffee. This experience is not going to stop me from trying other novelty Pepsi flavors in the future. And actually, I'm patiently waiting for more adventurous concoctions, like Kimchi Pepsi, or Monja Pepsi, or yes, even as my twitter friends suggested - Mentaiko Pasta Pepsi and Sweet Potato Pepsi. And you know what the scary thing is? I wouldn't be surprised in the least bit if one day I saw any of these flavors at the store. Kimchi Pepsi would go lovely with Umeboshi Kitkats.